Not in the IT support services industry? See other use cases. If you run an IT support service business, you’re no stranger to billing headaches. More than any other type of business, tech support businesses tend to use a lot of different billing models: one-time, recurring, per-user, per-unit, and more. For outsourced IT companies, this can lead to confusion come invoice and accounting time. What if there was a better way to manage recurring payments at your IT business? In today’s IT service industry, clients have come to expect flexibility. One-time projects, metered/per-unit projects, and set-fee recurring projects are all common in the IT landscape. But with flexibility comes a cost: complexity. With a client base using a variety of different billing methods, invoicing and accounting can be tough. Keeping track of metered/per-unit tasks is time-consuming. Invoicing generates a mountain of spreadsheet data. And occasionally, clients will neglect to pay bills on time. If you aren’t offering a variety of different payment plans, you’re missing out on potential revenue. And if you are, then you have a mountain of financial documentation to manage. Recurring billing. For services such as 24/7 on-call support, systems and network monitoring, and monthly consultation. Metered/per-unit pricing. For services such as hourly tech support, hardware updates charged by number of machines, and so on. One-off, per-project billing. For services such as initial setup and installation, one-time audits, and one-time upgrades. If you need an automated way to charge on a recurring or per-unit basis for IT support services, ChargeOver is for you. ChargeOver is a web-based app that automates payment plans and invoicing. The recurring model, where you charge clients a set monthly price for ongoing service. The metered model, where you charge per unit of service and bill for the total at the end of the month. The one-off model, where you bill one-time for a completed project. With ChargeOver, you have the power to set up any type of payment plan you wish, from metered to recurring payments, with options for tax customization, offering free trials, and more. As a result, you no longer have to record invoicing data manually or chase clients for payments. 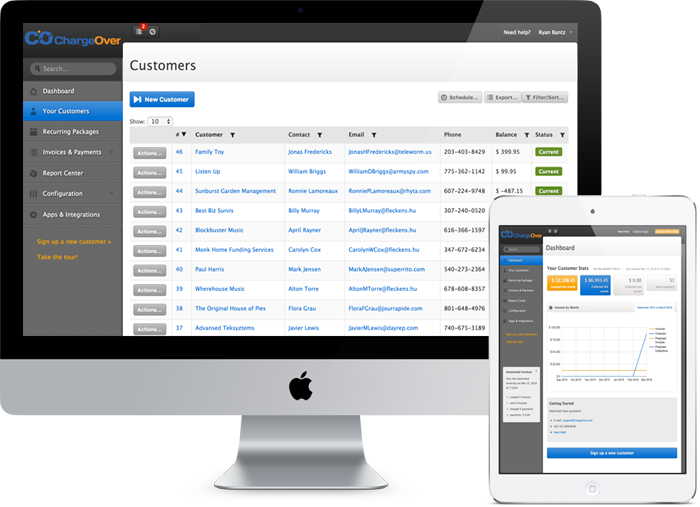 With ChargeOver, every step of the billing process is automated. 1. Attract and develop new business. In IT support outsourcing, it’s crucial to offer your clients the freedom to choose between different payment plans. Today’s IT clients have varying needs; some prefer metered pricing, while others prefer monthly-fee “retainer” arrangements. With ChargeOver you can give your clients metered, recurring or one-time plans, and everything in between. This helps you attract new business from clients who require specific payment terms. ChargeOver automatically generates invoice forms, and downloads financial data to your accounting software when an invoice is paid. This saves you the time you would normally spend manually creating invoices and managing accounting data, freeing you to focus on more important areas of your business. ChargeOver automatically generates invoice forms, and downloads financial data to your accounting software when an invoice is paid. This saves you the time you would normally spend manually creating invoices and managing bookkeeping, freeing you to focus on more important areas of your business. ChargeOver lets you set up automated and scheduled credit card and ACH payments, eliminating the need to remind clients (or yourself) to pay their bills. For each billing cycle, the software automatically charges your client’s payment method and funds are transferred to your accounts. The end-result is more predictable income, higher collection rates, and ultimately higher revenue. Create your ChargeOver account and start exploring its features. You can have your customers and plans running within minutes of signing up. Oh, and we’re giving you your first 14 days free. There’s no risk and no obligations.